You would think that playing my music would help with anxiety but somehow it doesn’t. When I feel depressed it is hard for me to play. It makes it worse.But then I feel depressed that I don’t do what I love. I have been a musician since I was 15 and now I am 48. I spent years learning and practicing. I would like to find a way to be able to play again. I am posting this in an effort to start again. Music used to be my life. This is me playing guitar and singing Twelve Gates Into the City. I love old gospel music and folk music. I usually play rock music and old rock and roll but I always add some of these folk type songs into my repertoire. Picture courtesy of Wikipedia. Ruth, Thelma, Audrey and Alfreda Davis sitting with Curtis Dublin. 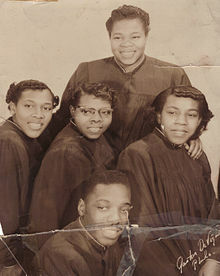 The Davis Sisters founded their singing group in 1945. They were from Philadelphia, PA. They were one of the first singing groups to sing what was coined Hard Gospel. They signed their first recording contract in 1947. Since that time this song has been a favorite of lots of folk singers. It has been covered by Joan Baez, Judy Collins, and Carly Simon and other female artists. I love folk music. I have some other folk songs in my repertoire. I also sing rock and roll music and acoustic rock music.